Fair Winds Press, 9781592335459, 176pp. Have Your Cake and Feel Good About It Too! Do whole grain flours intimidate you? Does amaranth flour sound fascinating but perhaps a little too froufrou? Do you love the chocolate cherry scones at your local coffee shop, but feel way too scared to attempt them on your own? Fears begone! You are now in the safe (albeit floury) hands of Celine Steen and Tamasin Noyes, two vegan ladies who know their way around the oven—and barley and buckwheat flour too. Expect to see not an ounce of white flour, refined white sugar, or powdered egg replacer in this book. Instead, indulge in wholesome breads, muffins, pies, pancakes, and other treats that draw on the nutty depth of flavor and enhanced taste of ingredients like whole grain flours and natural sweeteners. All you need is a bowl, a spoon, and a little “can-do!” attitude to whip up treats like Caramel Nut Barley Squares, Potato and Walnut Wheat Bread, and Chocolate Raspberry Tart. With more than 100 recipes to choose from, the hardest thing you’ll have to do is pick out what to bake first! Your taste buds will love you, your friends will adore you, your waist will thank you, and the planet will be singing your praises with Whole Grain Vegan Baking. You’re just a whisk away! 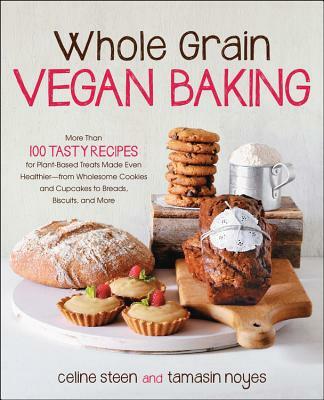 “Whole Grain Vegan Baking transcends basic whole wheat flour and makes wholesome treats that shine by introducing a variety of grains and flours in a collection of unique and inspired recipes. Complete with captivating photographs, Tami and Celine’s creations present irresistible solutions to healthful baked goods and desserts, each one splendidly imaginative.” —Kelly Peloza, author of The Vegan Cookie Connoisseurand Cheers to Vegan Sweets! â? ?Whole Grain Vegan BakingÂ transcends basic whole wheat flour and makes wholesome treats that shine by introducing a variety of grains and flours in a collection of unique and inspired recipes. Complete with captivating photographs, Tami and Celineâ? ?s creations present irresistible solutions to healthful baked goods and desserts, each one splendidly imaginative.â? â? ?Kelly Peloza, author ofÂ The Vegan CookieÂ ConnoisseurandÂ Cheers to Vegan Sweets!